Disclosure: I was provided with a screener to watch this movie, in exchange for my honest review. All views shared are mine and mine alone. I love country music, and have been a fan of Joey + Rory ever since they came on the country scene. And, then when Joey was diagnosed with cancer, I, like so many other fans, began following Rory's blog he started to document Joey's journey. This blog ultimately became the backbone of the movie he made to celebrate Joey's life and final months -- To Joey, With Love. The hit film, which was in theaters in limited release back in September and October, "is the true story of life, love and hope that never dies, chronicling Joey+Rory's journey as they simplified their lives, welcomed their daughter Indiana in the world and Joey fought and lost her battle with cancer, all while putting their hope in something far greater. " I really wanted to see this movie when it was on the big screen, but being a cancer survivor myself, I find it hard to watch movies that have to deal with cancer, as it gets me thinking of my experience with radiation and chemo, which I try to not think about. If you or a loved one have been diagnosed with cancer, then you know it is a hard pill to swallow when you hear those words---"You've got cancer." Having heard those words myself, I know just how Joey felt the first time she found out after giving birth to little Indiana. First shock and disbelief, then you try to figure out what you did wrong to get dealt this diagnosis. Why you? You didn't deserve it? Then, you wonder if you will be strong enough or that treatment will cure you. Joey faced her cancer head on and had surgery to remove her tumor. Then, she heard the same words I heard..."You are cancer free." Ah, praise the Lord. You are beyond elated, and now you can go on living your life and being thankful every day to be alive. But, Joey's happiness of her "new life" was short lived, as her cancer came back 6 months later. This time she heard from doctors that it spread. And, as you will see in the movie, if you didn't follow Joey's story, it continued to spread. Joey opted not to pursue treatment for her terminal illness. Instead, she chose to live her life (however long she had) on her terms -- at home with her family. She wanted to spend as much time with her baby girl as possible and be able to say her good-bye's to family and friends. Just knowing the outcome of this movie, and knowing I would see Joey battle cancer, and then lose her fight, was one of the main reasons I didn't want to see the movie in theaters, as it would have been hard to watch. And, then when I was sent the screener to watch this movie at home, I stalled to watch it. But, last night after the girls and my husband went to bed, I pulled out my laptop and watch the movie on the couch in the living room. I had the tissues next to me, and found myself crying throughout the movie. I was crying tears of joy in the beginning watching Joey and Rory welcome their daughter Indiana, and watching Joey fall head over heals in love with this beautiful angel. Then, tears turned to sadness as I watched her cancer journey shared. And, at the end, I was puffy eyed and no tears remained. My tissue box was empty, but I was left with a full heart. I found myself thinking about just how lucky I am to be here, after going through 40 rounds of radiation and 3 months of high dose chemotherapy for a rare form of cancer. I deal with some crumby side effects from treatments, that I will have for the rest of my life. But, as looked around the living room, I saw my daughters' artwork, their toys and photos of family and friends. Doctors said I wouldn't be able to have children, and now I have two beautiful girls, who are my world. They believed God would give them a great story … and He did. I love what Rory says throughout the movie -- "He believed God would give them a great story … and He did." And, as I sat in the living room last night after crying for an hour and half watching this movie, I couldn't help but feel the same way. God chose me to battle my rare cancer. But, this also made me a stronger person. And, now, 8 years in remission, I have a new story, and each and every day I wake to see a new day, I have more to add to "my story." Oh, how I wish Joey could have lived to see little Indiana grow up and have that fairy tale love story she had with Rory. But, God had other plans. He needed an angel with an angelic voice up in Heaven, and Joey answered his call. Now she is watching over Rory and Indiana from above, and hopefully smiling as she sees how her story was turned into a beautiful masterpiece thanks to Rory and his love for his wife. He shared so many personal memories of his wife through video footage, that we would otherwise not see, if we didn't know them personal. But, he did this to help tell Joey's story. And, when you sit down to watch "To Joey, With Love," you will see what an amazing job Rory did. Joey would be so proud of him. I am so happy I made myself watch this movie last night. Yes, is does touch her cancer and share parts of her cancer journey through the footage captured, but the film is more about the life Joey lived - which she truly lived to the fullest. Joey loved life and all those around her, and you can see this in the film. This is one movie you will find yourself watching time and again. It really does pull at your heartstrings, and will move you. Life is so crazy at times, especially with the holidays approaching, and we find ourselves forgetting just hour precious life is and how lucky we are to have the life we do. To Joey, With Love will just remind you to slow and and live in the moment, as we don't know how long we are here on this Earth, and when God will call for us to join him. I hope you get the opportunity to see this movie when it arrives on DVD on Dec. 20th, as it really is a wonderful love story, and story of life lived to the fullest, by an amazing woman, Mrs. Joey Feek. May she rest in peace, and may her family and friends never forget just how special she was. Experience the incredible true story of Joey and Rory Feek in the poignant new film TO JOEY, WITH LOVE. Intimately filmed by the couple over two and a half years, the movie documents the stirring journey of the 2010 Academy of Country Music Top New Vocal Duo. TO JOEY, WITH LOVE takes moviegoers from the birth of their daughter Indiana, born with Down Syndrome, through Joey’s struggle with and ultimate surrender to cancer—all amidst their never-ending hope in something far greater. 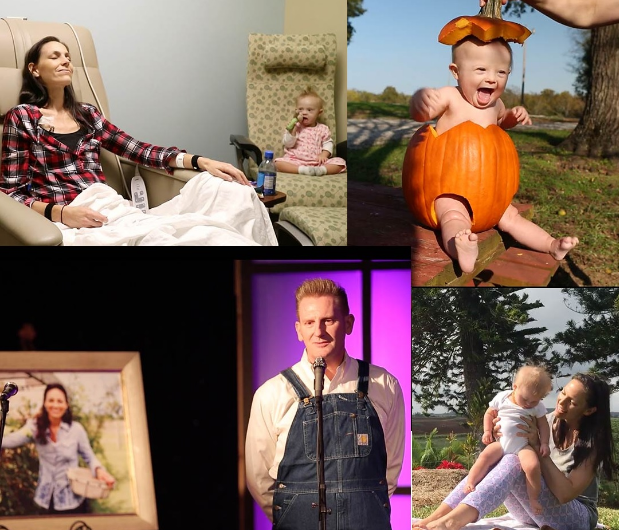 God gave Joey+Rory a love story for the ages, one that is sure to inspire hope and faith in all who experience it." I am excited to offer one lucky reader the chance to win a copy of To Joey, With Love, to enjoy with their family and share this touching love story with others. To enter, please complete then entries on the Rafflecopter form below. Good luck! I took myself to lunch. I went to visit two of my sons today, and got to be with all four of my children for Thanksgiving this year too. Life is great! I went for a run at the park today.